A self-professed computer nerd in Shanghai who broke up with (or was dumped by?) his girlfriend last year is making V-Day plans difficult for romantically inclined cinema visitors. “Couples looking to enjoy a romantic Valentine’s Day at one Chinese cinema will be out of luck this Friday, thwarted by singles who bought up all the odd-numbered seats. According to the Shanghai Morning Post, a group of Internet users reserved every other seat at a Valentine’s night showing of “Beijing Love Story” at a movie theatre in the city’s Xintiandi shopping complex. A graphic published by the paper shows how the group accomplished their mission, with every other ticket successfully purchased by the singles so that no two adjacent seats are available.” Link. Pakistan: Following the second cinema bombing Pakistani police have temporarily closed all cinemas in Peshawar and ordered security measures installed. “Citing numerous security threats and recent bomb attacks on cinemas in Peshawar, the Superintendent Police (SP) Faisal Mukhtiar has ordered on Thursday to shut down all cinemas in the city. In his orders, SP City asked cinema owners to install CCTV cameras within a month, and ensure proper security, failing which an action would be taken against them.” Link. Australia: The reshuffle at Hoyts and Val Morgan has been completed. “The Val Morgan Cinema Network has promoted its chief revenue officer Daniel Hill to managing director, following the promotion of CEO Damian Keogh to CEO of the Hoyts Group earlier this week. Hill joined Val Morgan as national sales manager in 2011 having previously spent almost a decade working on the sales team at Channel Seven, and then gone to IMG Fashion as general manager.” Val Morgan has managed an impressive 40 per cent growth in the last couple of years in a flat advertising market. Link. USA: Screenvision strikes up interesting partnership that crosses over into TV. “Today, national cinema advertising leader Screenvision announces an exclusive program with Carnival Cruise Lines to showcase the brand’s new spot, “Bobslide,” which is debuting nationwide in cinemas during the Sochi 2014 Olympic Winter Games. The program with Carnival is the latest example of brands pairing cinema and TV for greater impact, including incremental reach versus key younger demos, and blockbuster impact on key measures of brand awareness and brand affinity.” Perhaps even more interesting is the Shazam integration into the campaign. Link. UK: More information about DCM’s geo-location campaign for WV. “On the face of it, the spot, created by Adam & Eve/DDB with media by MediaCom, seems nothing out of the ordinary. It tells the story of a tall woman looking for love, who is surprised when the only man who fits the bill turns up to their date in an Up!. However, using Digital Cinema Media’s new geo-location tool, VW gave the ad a local spin – directing audiences to their nearest VW retailer by featuring an address in the final frame.” The next step will be to link the ad to cinema goers’ smartphones. Link. UK: A BBC childrens’ television classic is coming to the big screen. “Legendary kids TV show, Bagpuss, is 40 years old, and to celebrate he, and his original owner, are coming out to play! All thirteen (yes, there were only that many) episodes of the classic 70?s show are being digitally remastered in HD and shown in cinemas around the country throughout the year.” Link. USA: Switching from analogue to digital can be a shock for projectionists, like this one from amherst. “The new digital projector cost $44,000, with accessories increasing the price to $60,000, Costilow said. “I’m a little scared with the technology,” Costilow said. “I could fix the other one with paper clips, duct tape and rubber bands. This is a computer. I’m still carrying a flip phone. “Now if it doesn’t come on, I’m going to be lost,” Costilow said. “We’ve never missed an opening show in 15 years. I pride myself in keeping breakdowns to a minimum.”” So far it’s been running well. Link. Ireland: Questions are being raised about whether this is the best allocation of 20m euro of public money in a country still just emerging from the Great Recession. “THE SHOW will go on for the new six screen cinema in Drogheda Town Centre, despite NAMA’s investment of €20m in public money on the second cinema complex planned at Scotch Hall. The Drogheda Independent was given exclusive access to the exciting multi-million euro complex in West Street, which will open to the public in June of this year. Melcorpo, which owns Drogheda Town Centre, claims the eight-screen development at Scotch Hall will impact heavily on the market in Drogheda, but in the race for completion, they can already see the finish line.” Link. UK: “Mulitplex giant Odeon has been revealed as the ‘big name’ behind Northwich’s long-awaited new cinema. 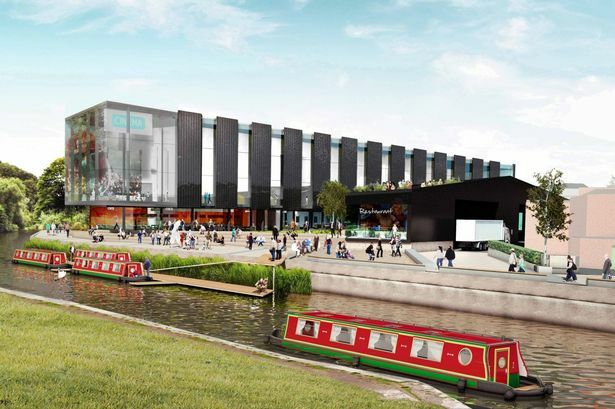 The UK’s largest cinema chain has agreed terms to operate a digital five-screen cinema at the heart of the iconic Barons Quay development.” Link. UK: “BOLTON could soon have not one but two town centre cinemas after plans for a second one were announced by Bolton’s other big shopping centre. The owners of Crompton Place want to build a new 11-screen multiplex alongside a range of restaurants, cafes and bars. The proposals come less than a month after rival shopping complex the Market Place was given the go-ahead to spend £15 million on a nine-screen cinema plus eateries by demolishing parts of its car park.” Link. UK: “THE new manager of the Regent Centre in Christchurch has promised to inject fresh vitality into the venue and oversee cosmetic improvements to the building. Greg Rawlings, a former Pontins Blue Coat who grew up in the area, joined the centre two weeks ago after supervising the conversion of the former Moderne cinema, Winton, into a multi-purpose conference centre… Mr Rawlings stressed he wants to maintain the theatre’s atmosphere, which is largely run by volunteers, but is keen to explore the possibility of broadening the range of events offered to appeal to a younger audience.” Link. CineStalgia: The LA Conservancy is running a series of classic films in vintage cinemas in Los Angeles this summer called Last Remaining Seats. “”The Lady Eve” is up first, on Wednesday, June 11 at the Los Angeles Theatre, and “Citizen Kane” ends things at the Orpheum on Saturday, June 28. “El Gran Calavera” lands at the Palace on June 25, and a new — or, er, old — theater is in the mix: The former United Artists theater, now The Theatre at Ace Hotel. “Back to the Future” is the June 21 movie.” Best of all will be “West Side Story” screening at the Dorothy Chandler Pavilion on Saturday, June 14. tickets go on sale 9 April. Link.